A 6×8″ manuscript dated July 4, 1776, relating to black soldier Cuffee Dole’s plight near George Washington’s Cambridge headquarters, will appear in a New York auction on July 24. It is the earliest located document of the newly-independent United States which identifies an African-American by name. 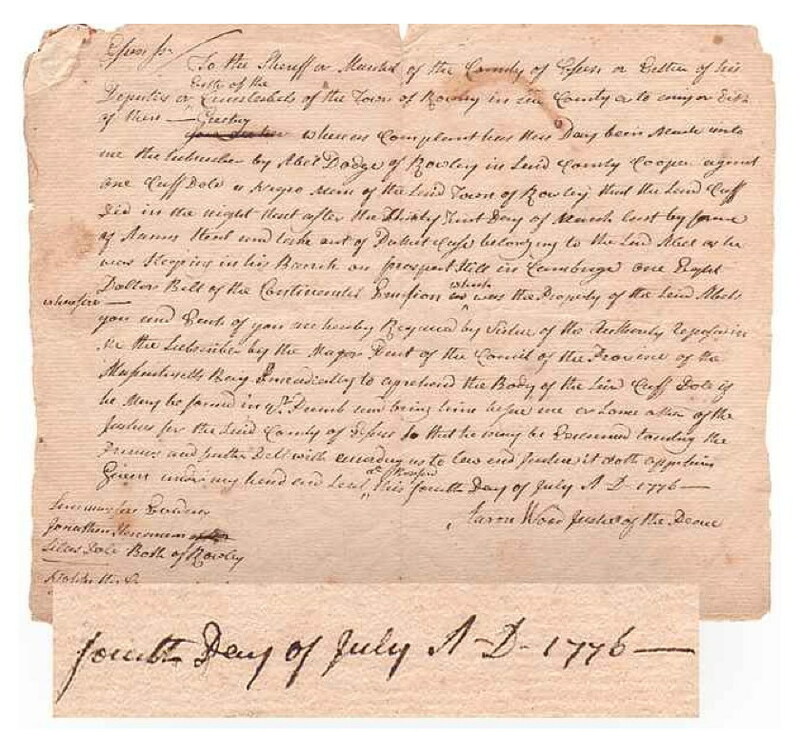 Believed the earliest known document of the newly-independent United States identifying an African-American by name. Dated July 4, 1776, African-American soldier Cuffee Dole’s life has become a legend in his corner of Massachusetts, encompassing slavery, freedom, patriotism, and forgiveness. In July 24, 2018 auction, http://cohascodpc.com, Lot 5-1. One of two letters, offered together, of Teddy Roosevelt urging government neutrality in health care, and freedom to practice and choose. To a Christian Scientist – who had been charged with practicing medicine without a license – Roosevelt writes, “I do not believe that the Federal Government should…dictate therapeutic methods…The Progressive Party will live up to this and every other promise it has made….” In July 24, 2018 auction, http://cohascodpc.com, Lot 14-3. Born free, Dole was sold into slavery by his treacherous nurse. Confessing on her deathbed that he was in fact freeborn, Dole’s patriotic service was also dramatic and heartrending. Accused in this document of taking an 8-dollarbill from a fellow soldier – in the house later immortalized in a Longfellow poem – the charges were dropped. Serving honorably, Dole likely crossed paths with Washington. A sought-after cook, he became known in the finer homes of Boston for his sumptuous banquets. Bids are accepted up to July 24, 2018, 9:00 P.M. E.S.T. All items are fully described at http://cohascodpc.com.